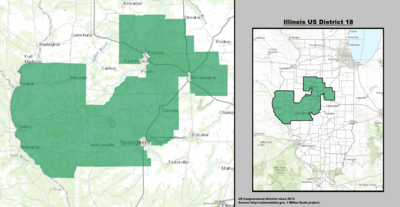 The 18th Congressional District of Illinois covers central and western Illinois, including all of Jacksonville and Quincy and parts of Bloomington, Peoria, and Springfield. Republican Aaron Schock had represented the district since January 2009, but resigned March 31, 2015. Special elections were called to select Schock's replacement, with a primary on July 7 and the main election on September 10, 2015. Republican State Senator Darin LaHood, son of former Rep. Ray LaHood, won the special election and reelection in 2016 and 2018. Illinois's 18th congressional district—since January 3, 2013. Abraham Lincoln served much of the area that now lies within the 18th district for a single term; it was numbered as the 7th district at the time. It also contains most of the territory that was represented by future United States Senate Minority Leader Everett Dirksen (1933-1949, when it was the 16th District) and longtime House Minority Leader Bob Michel (1957-1995). From 1949 to 2015, the district was represented by someone who either attended or graduated from Bradley University. The district covers parts of McLean, Peoria, Sangamon, Stark and Tazewell counties, and all of Adams, Brown, Cass, Hancock, Logan, Marshall, Mason, McDonough, Menard, Morgan, Pike, Schuyler, Scott and Woodford counties, as of the 2011 redistricting which followed the 2010 census. All or parts of Bloomington, Chatham, Jacksonville, Lincoln, Macomb, Morton, Normal, Peoria, Quincy and Springfield are included. The representatives for these districts were elected in the 2012 primary and general elections, and the boundaries became effective on January 5, 2013. 49th Redistricted from the 17th district. March 3, 1897 54th Elected to finish Remann's term. 62nd Redistricted from the 12th district. Redistricted to the 23rd district. 116th Elected to finish Schock's term. * Write-in and minor candidate notes: In 1994, write-ins received 955 votes. In 1998, write-ins received 2 votes. In 2008, Green Party candidate Sheldon Schafer received 9,857 votes. In 2010, Schafer received 11,256 votes. Ray LaHood decided not to seek re-election in 2008 and was chosen by Barack Obama to serve as U.S. Secretary of Transportation. Illinois State Representative Aaron Schock of Peoria won the seat for the Republicans in the November 4, 2008 election. His main opponent was Democrat Colleen Callahan, of Kickapoo, a radio and television broadcaster. Green Party candidate and educator Sheldon Schafer, of Peoria, was in a distant third place on the ballot. As of January 2017[update], two former members of the U.S. House of Representatives from Illinois's 18th congressional district are alive. ^ Barone, Michael; McCutcheon, Chuck (2013). The Almanac of American Politics 2014. Chicago: University of Chicago Press. pp. 595–598. ISBN 978-0-226-10544-4. Copyright National Journal. ^ "Rep. Aaron Schock Plans to Resign in Wake of Spending Probe". The Washington Post. Retrieved March 17, 2015. ^ Garcia, Monique (April 14, 2015). "Judge sets special election dates for Schock seat in Congress". Chicago Tribune. Retrieved April 17, 2015. ^ "Darin LaHood wins special election to replace ex-U.S. Rep. Aaron Schock". Chicago Tribune. September 10, 2015. Retrieved September 10, 2015. ^ Retirement Announcement of Rep. Ray LaHood (Part 1 of 3). YouTube. August 11, 2007. Retrieved April 17, 2015. ^ Sherman, Jake; Palmer, Anna; Bresnahan, John (March 17, 2015). "Aaron Schock resigns after new questions about mileage expenses". Politico.com. Arlington, Virginia. Retrieved April 17, 2015. ^ "Election Statistics". Office of the Clerk of the House of Representatives. Archived from the original on July 25, 2007. Retrieved October 6, 2011. ^ "Elections". WEEK News 25 website. Granite Broadcasting. November 5, 2008. Archived from the original on December 10, 2008. Retrieved November 5, 2008. 100% of precincts reporting. Unframed data at "Archived copy". Archived from the original on April 13, 2009. Retrieved February 18, 2011. CS1 maint: Archived copy as title (link).